Phil Elliott: Jo Bob is here to remind us that the biggest and the baddest get to make all the rules. Phil Elliott: Agreeing doesn't play into it. At some point along the way the line between athleticism and off-the-field antics got deeply blurred. The side columns in the sports pages read like a police blotter. Within the past week we have seen players charged with sexual misconduct, conspiracy to commit murder, and domestic abuse. And some have even walked away from double murder charges to win the Superbowl MVP award. So what does this say about professional sports? Well, it certainly makes for good drama. North Dallas Forty, a semi-fictional story based on the Dallas Cowboys, also makes for some good drama. Nick Nolte stars as Phillip Elliot, an aging wide receiver for the North Dallas Bulls. Elliott was once a star, but now spends his time on the bench for the most part despite having "the best hands in the game" as his coach tells him more than once. Bruised and nearly broken, Elliott begins to rebel against the team's coach (Spradlin) who is obsessed with winning a championship at any cost. But after he meets a beautiful woman (Haddon), Elliott soon begins to realize that there is life after football. 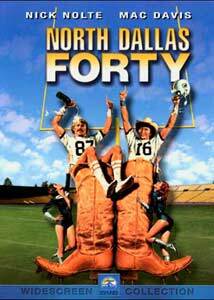 Many herald North Dallas Forty as one of the best sports films of all time and the best ever made about football. Maybe they are seeing something I am not. The film is good, but there are too many flaws in the picture to compare it to a sports classic like Raging Bull or even the much more intense football drama Any Given Sunday. The reason the latter worked was because it showed the hard-hitting weekly game as well as the mid-week routine of the players. North Dallas Forty seems to be more content with showing us only the routine and focuses on just one week in the players lives. By showing us the seven days between games, director Ted Kotcheff creates nice character development, but unfortunately, only Elliot. Other players fade into the background and have a few memorable scenes, but never enough to make the viewer care for them. The most positive aspect of Kotcheff's direction is that there isn't a "big game" in which everything is laid on the line. There is a game, but it is inconsequential in the larger scope of things. Sadly, after this film Kotcheff's career was benched thanks to pictures like First Blood and Weekend at Bernie's. If you are trying to put those three films together as being by the same person, you are more than likely as confused as I am. The cast succeeds mainly because of the performances by Nick Nolte and Mac Davis. Nolte, who I will admit I don't like all that much, is perfect here as Elliott. Davis has a lot of fun with his role as not only a womanizer, but also an aging quarterback who must protect his job. Other great supporting performances come from Charles Durning and Bo Svenson. Image Transfer Review: The anamorphic 2.35:1 transfer from Paramount really fails to deliver. Colors go from being bleached out and dull in chapter one to vibrant and clean in chapter 2. On the whole the image suffers from a lack of detail and too much softness. Blacks don't show up well, and there is a strong amount of grain in some scenes. There are some scratches on the print early in the film, noticeable on the logo, but they clear up and are not seen again. Overall, this is one of the worst transfers I have seen from the folks at Paramount. But what is one bad apple among the bunch, right? Audio Transfer Review: The original mono soundtrack has been reworked providing a new Dolby Digital 5.1 mix, but the results are less than spectacular. The track suffers from so many flaws that I can't help but wonder why they didn't just stay with the original mono track. Dialogue sounds awful for the most part but there are a few moments where it is more natural. The musical score is rich and creates a nice soundfield when it comes out of the surrounds. But the dialogue makes this one of the worst tracks I have ever heard. There is a slight hiss for most of the film's length and it gets annoying two minutes into the two-hour film. An equally bad Dolby English 2.0 mix is also available. Extras Review: Wow, this is going to be the easiest extra features review I have ever written. Nothing. Absolutely nothing. As I am writing this review an XFL game is playing on the television next to me. Football is a contact sport through and through, and North Dallas Forty shows us its pain close up. It isn't as in your face as Any Given Sunday, but to compare the two is like apples and oranges. They would make a great double-bill, though. Unfortunately, Paramount has chosen to drop the ball with this release. Pick this one up only if you are a fan. Rent it if you are curious.